กระดาษทดสอบคาร์บอเนต ฮาร์ดเนส (0 – 360 ppm.) | All Test Kit by Higher Enterprises Co.,Ltd. 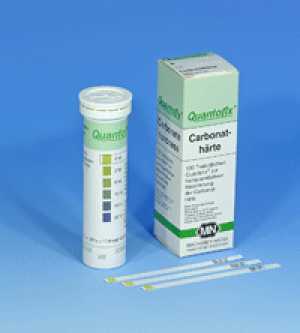 This test strip is for the rapid and reliable determination of alkalinity or carbonate hardness in water. The easy dip-and-read-procedure provides a reliable result within 30 seconds. Carbonate hardness or alkalinity is a measure for the waters pH-buffer capacity. If the Carbonate Hardness is higher, addition of acids or bases will have a lower influence on the resulting pH. Sudden and rapid pH-changes of the water are avoided. QUANTOFIX® Carbonate hardness is used for the quick and easy control of water in swimming pools and aquariums.